Description: Large framed paper certificate mounted behind glass with a brown wood frame. 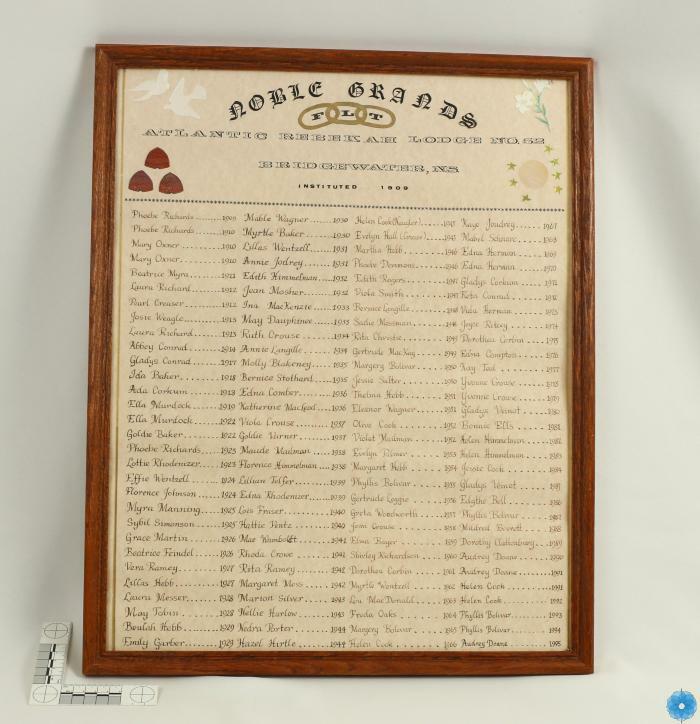 Certificate has hand printed names of the Noble Grands for 1909 to 1995, for the Atlantic Rebekah Lodge, No. 52, Bridgewater, N.S., instituted in 1909. Below words is three gold intertwined rings with letters FLT. inside each ring. Two white paper birds are mounted at left of name. Three red paper bee hives are mounted at left below birds. A paper lily is mounted at the right corner. Seven paper gold stars are below the lily. History of Use: Used by the Atlantic Rebekah Lodge, No. 52 to record the names of their Noble Grands.